The Great Wall of China is one of the most spectacular architectural structures of all time. With a length of about 3,946 miles, the Great Wall was originally built in the 1600s to keep Mongolian horsemen from invading China. The wall was also constructed to showcase the Emperor's power and glory. Other kingdoms had already built their own walls and towers, but none of these even came close to the size of the Great Wall. During its construction, the Great Walls' walls were connected and many miles of new foundation were laid. The 300,000 workers who built the Great Wall were under the command of Qin Shihuangdi, a brutal tyrant. Shihuangdi was the first person to rule a united China. Over the years, the Great Wall gradually fell into disrepair. 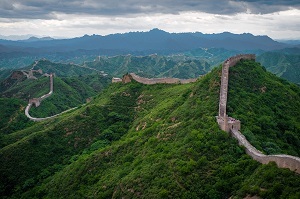 During the Sui Dynasty, over a million workers were forced into labor to fix the wall. Half of them perished and were buried inside of the wall itself. Since the Sui Dynasty repairs, only sections of the Great Wall have been restored for tourists. To this day, the Great Wall of China is the longest establishment in the world and one of the most visited places.